Jack Watkins made 157 appearances for Gloucester between 1946 and 1952. He played back row and lock for Gloucestershire before establishing himself at prop, playing in the County Championship Final of 1949 and the final England trial of 1950. Watkins captained the club from prop in 1951-52 when they established a new record of 30 victories in the season. Watkins was a policeman and while on point duty at the Cross in Gloucester would sometimes wave the opposing team’s coach across before rushing back to Kingsholm to put on his kit and turn out against them. Jack Watkins, then stationed in Tewkesbury, joined Gloucester from Lydney RFC and made his 1st XV debut at Blackheath on December 7 1946. He played in the back row where he gained a regular place for the remainder of that season. He quickly gained a reputation as a tough competitor and moved up to the second row for the match at Cardiff in October 1947, which was narrowly lost. Selection for the county against Cornwall in the back row the following month was followed by his front row debut for Gloucester against the UAU in December. Back in the second row for the Gloucestershire defeat against Eastern Counties in the County Championship semi-final he was singled out for praise by the press in an otherwise disappointing Gloucestershire performance. 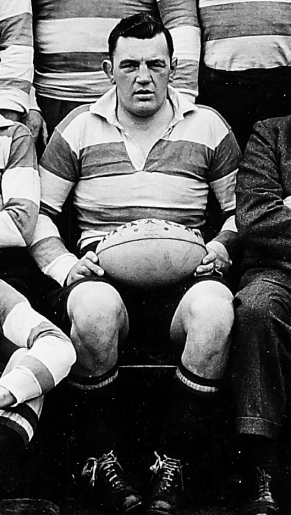 He continued to perform as a utility forward in 1948-49 and although prop had become his favoured position he played for Gloucester against Wasps and Leicester in the back row that season while playing second row for the county in the semi-final and prop in the final of the County Championship. After further county caps, injury in January 1950 ended his season, but after a late start to 1950-51 a series of good performances led to an appearance for The Rest against England in the final trial in a pack that performed creditably. Jack Watkins was appointed club captain for 1951-52. The club record number of victories was achieved when Gloucester won at Teignmouth in the last match of their annual South West tour. As captain, he was a strong disciplinarian who led by example. The veteran Watkins led his club in 43 of the 45 games played that season. After playing in the first game of the following season, Jack Watkins struggled to keep his 1st XV place and in December 1952 he moved back to Lydney. He played for his old club against Gloucester on a couple of occasions before his eventual retirement.